Let's face it - an Armani branded phone is like a t-shirt with the Armani logo. It's got the stamp but it's not an Armani suit, not by a long shot. We're slowly venturing into luxury item territory, but we'll stay in the more reasonable range for now. The type of phone we'll be looking at here is the Nokia 8-series or say… the Motorola Aura. They cost (or did when they came out anyway) around 1000 euro and are a status symbol without being collector's items reserved for millionaires only. There's a reason we start with the Nokia 8-series. The Nokia 8910 was one of the earliest examples of a luxury phone. Its titanium body slid smoothly open thanks to a spring assisted mechanism and it came with a leather pouch. It really set the tone for the rest of the 8-series to come. Soon after it, the Nokia 8910i update added a color screen to the mix. But enough history, let's look at more recent phones. The Nokia 8800 is what came after the 8910i and spawned a slew of successors. 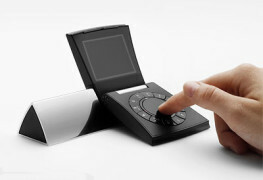 It dropped titanium in favor of stainless steel but kept the tradition of dropping a few extra treats in the box: a desktop stand, an extra battery and a leather carrying pouch, not to mention the exclusive ringtones composed especially for the 8800 phones. This is important because the phone had about the same functionality as the much cheaper Nokia 6230i. 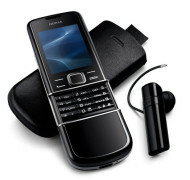 The premium accessories justified the exorbitant price and added to the experience of owning a Nokia 8800. It too got the upgrade treatment with the Nokia 8800 Sirocco edition. The Sirocco bumped up the specs, added a Bluetooth headset to the package but most importantly it was available in Gold. 18 carat gold plating is something we'll see Nokia go back to. The Nokia 8600 Luna is an offshoot of the 8800 - with a body made of stainless steel, its claim to fame was the smoked semi-translucent glass covering the keypad. The latest branch in the 8800 family tree is the Arte series. The first two - the Nokia 8800 Arte and 8800 Sapphire Arte - added 3G, an OLED screen with eye-pleasing colors and minor upgrades for the rest of the spec sheet. The Sapphire Arte even had a sapphire stone on the D-pad and genuine leather patches on the front and rear. From then on, the Arte family grew with a couple of new editions that emphasize on a certain material. 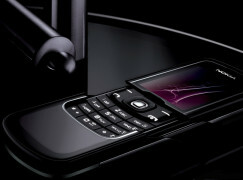 The Nokia 8800 Carbon Arte was first, made of carbon fiber that's found on so many sports cars that the association with racing was unavoidable. 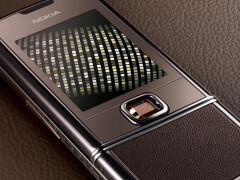 Then there was the Nokia 8800 Gold Arte, which opted for gold - a truly timeless luxury item. That's it for the Finnish brand for now, we'll meet them again in the next section through their Vertu subsidiary. Now let's look at a couple of phones made famous by their displays. 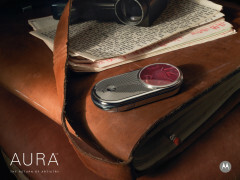 The Motorola Aura (endorsed by no other than David Beckham) took pride in having the world's first circular display. It was even more impressive with its 16 million colors and 300dpi pixel density (the super sharp iPhone 4 display has 326dpi). The display is covered by a 62 carat sapphire crystal, the back is stainless steel with chemically etched patterns. The opening mechanism is Swiss-made, complete with a small window to see the gears in action, just like a mechanical watch. And if that's not enough, the Motorola Aura Diamoniqe added 90 diamonds around the display (for a total of 1 karat). It was genuinely a limited edition, with no more than 50 units released. The slightly cheaper and less exclusive Motorola Aura Gold has 24 carat gold plating. There are a couple of other versions too. The Diamond edition has 34 diamonds and 18 carat gold plating, while the Celestial edition commemorated the first Moon landing of Apollo 11. Another handset in this price range, the Sony Ericsson XPERIA Pureness, boasts a unique display too - it's truly transparent. The Pureness was the first and still the only phone from a major manufacturer to have a see-through screen. Too bad it's tiny and monochrome, and shame the Pureness has the overall build quality of a much cheaper phone. But the wow-factor is there, nonetheless. Samsung in yet another joint venture, this time with Bang & Olufsen,produced a couple of unique looking (and sounding!) phones too - the Serene and the Serenata. These phones are sure to turn some heads and tell onlookers you're well off. Sometimes functionality alone doesn't cut it - you need to dress for the occasion. That used to mean a watch, cufflinks, ties and such but now you need a phone too. This isn't Victorian England with the strictest of dress codes, but you still have to dress up if you want to make a good impression. 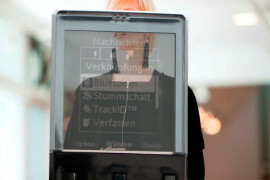 And if you need to take a call, few would do better than some of these elegant gadgets. These phones we've mentioned so far are fairly affordable by luxury phone standards. It's the next chapter where prices (and stakes) get higher.